This product is truly amazing and does all that it claims!! It will not disappoint. It goes to work immediately and within 3 days your rough dry heels are like a baby's bottom. What a joy! Works like a charm!! When I develop cracks in my heels, I use this over several days and my heels become smooth again. Very easy to apply as well! I have always had extremely dry heals that would crack and bleed. When they got really bad I would use Vaseline and that would barely help. Recently I was on vacation and the combination of the dry weather and going barefoot and walking on rock made my normally uncomfortable dry and cracked feet horrendous. I could barely walk and the pain was incredible. I had never seen so many cracks in my feet before, some of them 3-4mm deep. A trip to Wal-Mart had me purchasing your product and after the initial application, the relief I felt was immediate. I was so impressed. After just one dose I was able to walk without pain. I've been using the cream for about 10 days now, the redness is completely gone and the cracks have almost disappeared entirely. My feet have never felt so nice and smooth. I love the easy to use stick applicator. It's so nice to rub it on and not have to get my hands all covered in cream. I've been telling everyone I know about this amazing cream. Now I will need pedicures only to keep my nails nice and no longer to try and keep heel cracks to a minimum. Nothing has ever helped my skin problems until my mom got me this! I can't even begin to tell you how happy I am! My legs and arms were driving me crazy with itching and open sores from scratching. Since I got Flexitol, I am so extremely happy to see them clear! Thank you so much! 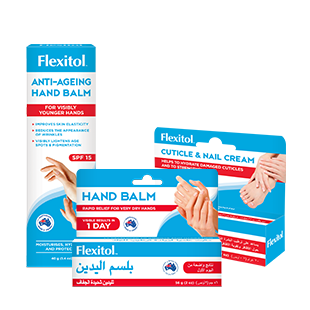 Flexitol Hand Balm is by far the best cream I have tried, and I've tried many. 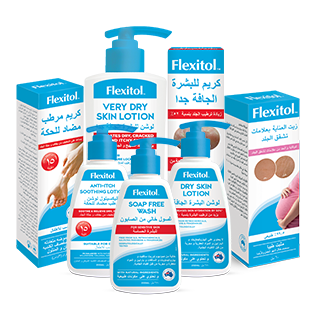 My hands and fingers are extremely dry, they crack and bleed and Flexitol is helping me manage this condition. Would recommend it to anyone who suffers from this. The lip balm had truly unexpected benefits! 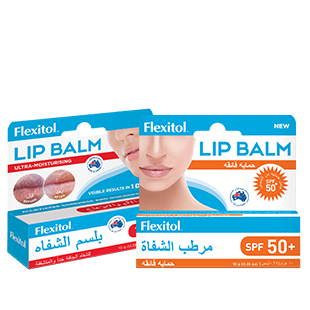 At a time when my lips became over-dry and sensitive a few months ago, I began using Flexitol Lip Balm, at least daily to relieve the problem. It did!!!!!! All I can say is... Wow! 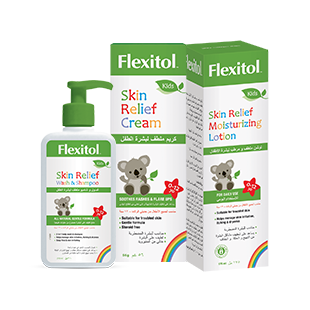 Thank you Flexitol! The Happy Little Bodies Eczema Shampoo and Wash gently cleanses my son's skin without irritating his eyes or drying out his sensitive skin. It rinses clean and leaves him feeling soft and smelling fresh. I was very pleased with all these products, they worked well for us and I love that they are all made with natural ingredients.